Can You Handle This 5 X 5 Set? You already know that exercises like Jump Squats, Box Jumps, a variety of Lunges, and more get you leaner and more athletic. In fact, that’s why I put in a 5 X 5 set scheme in Workout A of “Spring Charge”, the new 4-week program I just wrote. Hang on… we’ll get to that in a second. But If you or a training partner are suffering from any sort of knee discomfort that is keeping you from giving 100% during your workouts (especially Workout A of Spring Charge) you should check out this system. 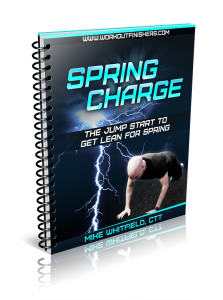 For the price of a few bottles of advil, which do NOTHING for the long term, you can get rid of nagging knee pain for good and DOMINATE your workouts like the Spring Charge program. This is not your typical rehashed rehab stuff that your grandma uses. Fix My Knee Pain utilizes the KR3 Method designed by Injury Specialist Rick Kaselj. By the way, Rick is wickedly smart. Rather than focusing on stretching and strengthening which is the norm, Rick uses his “Knee Reshaping 3-Part Method” which is based on one key concept. Does this sound almost too good to be true? Well my friend Mike Westerdal who teamed up with Rick to offer this product personally used the system to alleviate knee soreness that was lingering from an old football injury and years of squatting over 600 pounds in powerlifting competition. And even if you don’t lift that heavy, even metabolic workouts that use a lot lunges, jumps, etc. can bring you down because of that “achy” feeling. If it worked on him, it will work on you like it has for thousands of Rick’s clients. Plus, think about it. If you learn just one trick (you’ll learn way more than that) the entire system pays for itself. As if the price wasn’t a good enough deal already this will put you over the top and make this a no-brainer for you. When you start eliminating knee pain TODAY, you’ll also get access to this bonus. The Squat has been called the King of all exercises because it involves so many muscle groups and releases growth hormones, which you know can help you burn fat 24/7. Unfortunately a lot of us hack the form and make a perfectly safe exercise something that can lead to knee pain and potential injury if done incorrectly. This doesn’t have to be the case! Rick Kaselj, MS put together a video guide to Pain Free Squatting to celebrate the Fix My Knee Pain Sales event. You’ll be shown how to perfect your form in an easy to understand step-by-step manner. After using Fix My Knee Pain and implementing the tips from Pain Free Bench Squatting your knees will be feeling like new again and you can start squatting the way you want again. As usual, Rick and Mike overdelivered, so I wanted to give you my own bonus…. Spring Charge. You’ll discover the 5×5 set in Workout A (and that’s just the beginning), plus the Metabolic 100 Finisher. But my favorite part of this new one is the upper body superset in Workout C, where you’ll do 6 sets of your max reps of two powerful upper-body exercises back to back. Now when it comes to using 5 x 5 sets, they are fun and challenging, but the truth is that most people get it all wrong. When you use 5 x 5 schemes, put them early in your workout when you’re fresh. Obviously, a 5-rep scheme is demanding more of your strength, so you shouldn’t be fatigued when performing them. For example, let’s say you want to do 5 reps of 5 sets of the Squat. Imagine how much weight you could do early on. Now imagine doing that after a series of lunges, DB Romanian Deadlifts, etc. You wouldn’t have the strength to do it as effectively. So when doing 5 x 5 sets… remember – early when you’re fresh. Also, if you’re looking to get leaner, the 5 x 5 scheme is a great way to maintain muscle definition as you lose fat. But I typically don’t write any more than 1-2 per week. That’s been working like a charm for my long time client. He’s really strong (especially in the legs) and I want him to maintain that as we do these metabolic workouts. 2) 1 set of 5 reps using about 60% of the weight we’re planning on using for the “work” sets. And in Workout A of Spring Charge, you’ll start off the week with a 5 x 5 scheme. But you’ll need to make sure you’re ready for the 5 x 5 lower body exercise set in Workout A. Or do something to Fix It. All you need is a few minutes per week to spend on this and you’ll feel a tremendous difference. Then forward your receipt to us at cranktraininghelp@gmail.com and we’ll send you the bonus.